The long awaited Windows Vista Service Pack 2 has finally entered into RC stage and it’s already available to testers. They have managed to achieve significant performance improvements over the Windows Vista SP2 Beta. The build string for Windows Vista SP2 RC is 6002.16659.090114-1728. 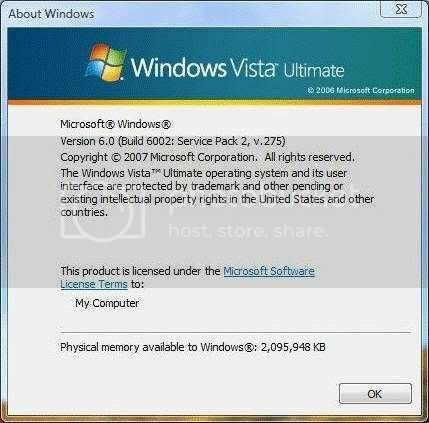 Windows vista service pack 2 contains all the old patches, hotfixes & updates and also includes 656 individual hotfixes. It’s expected that Microsoft will release Service Pack 2 RC for public preview next month. Well, looks like we don’t need to wait for a month to get hands on the SP2 RC, it’s already leaked over the web and is available for download via Bittorrent network. You can have a look at the download links below. NOTE: Make sure that you have Windows Vista SP1 installed before attempting to install Vista SP2 RC build. Also, remove Window Vista SP2 Beta if installed before.